On 12 December 2013, North Korean news outlets reported that Kim Jong-un had ordered the execution of his uncle Jang Song-thaek due to "treachery". Kim is widely believed to have ordered the assassination of his half-brother, Kim Jong-nam, in Malaysia in February 2017. In 2018 Kim Jong-un and President of South Korea Moon Jae-in met twice in Panmunjom on the border between North and South, and once in Pyongyang. On 12 June 2018, Kim Jong-un and US President Donald Trump met for a summit in Singapore, the first-ever talks held between a North Korean leader and a sitting US President, to discuss the North Korean nuclear program. A follow-up meeting in February 2019 ended abruptly without an agreement. Most analysts agree that Kim Jong-un attended Kim Il-sung University, a leading officer-training school in Pyongyang, from 2002 to 2007. Kim obtained two degrees, one in physics at Kim Il-sung University, and another as an Army officer at the Kim Il-sung Military University. In 2012, Kim Jong-il's personal chef Kenji Fujimoto visited North Korea and said, "Stores in Pyongyang were brimming with products and people in the streets looked cheerful. North Korea has changed a lot since Kim Jong-un assumed power. All of this is because of leader Kim Jong-un." In 2013, Kim re-established his grandfather's style when he made his first New Year's address, a break from the approach of his father. Kim Jong-il never made televised addresses during his 17 years in power. In lieu of delivering a speech, Kim Jong-il contributed to and approved a New Year's Day editorial, jointly published by Rodong Sinmun (the daily newspaper of the Korean Workers' Party), Joson Inmingun (the newspaper of the Korean People's Army), and Chongnyon Jonwi (the newspaper of the Kimilsungist-Kimjongilist Youth League). According to several analysts, North Korea sees the nuclear arsenal as vital to deter an attack, and it is unlikely that North Korea would launch a nuclear war. According to a RAND Corporation senior researcher, Kim Jong-un believes that nuclear weapons are his guarantee of regime survival. During the 7th Congress of the Workers' Party of Korea in 2016, Kim Jong-un stated that North Korea would "not use nuclear weapons first unless aggressive hostile forces use nuclear weapons to invade on our sovereignty". However, on other occasions, North Korea has threatened "pre-emptive" nuclear attacks against a US-led attack. In December 2015, Kim stated that his family "turned the DPRK into a powerful nuclear weapons state ready to detonate a self-reliant A-bomb and H-bomb to reliably defend its sovereignty and the dignity of the nation". In his 2018 New Year Speech, Kim announced that he was open to dialogue with South Korea with a view to take part in the upcoming Winter Olympics in the South. The Seoul–Pyongyang hotline was reopened after almost two years. North and South Korea marched together in the Olympics opening ceremony, and fielded a united women's ice hockey team. In addition to the athletes, Kim sent an unprecedented high-level delegation including his sister, Kim Yo-jong, and President of the Presidium, Kim Yong-nam, and performers such as the Samjiyon Orchestra. On 5 March, he had a meeting with South Korea's Chief of the National Security Office, Chung Eui-yong, in Pyongyang. In March 2018, Kim visited Beijing, meeting with General Secretary of the Communist Party of China, Xi Jinping. From 7–8 May, Kim made a second visit to China, meeting with Xi Jinping in Dalian. On 26 May, Kim had a second and unannounced meeting the North Korean side of Panmunjom, meeting with Moon to discuss his proposed summit with Donald Trump in Singapore. On 10 June, Kim arrived in Singapore and met with Prime Minister Lee Hsien Loong. 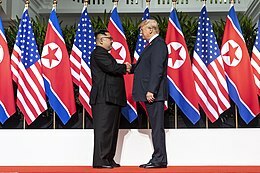 On 12 June, Kim held his first summit with US President Donald Trump and signed a declaration, affirming a commitment to peace, nuclear disarmament, and the repatriation of the remains of U.S. war dead. In February 2019, Kim held another summit with US President Donald Trump in Hanoi, Vietnam, which Trump cut short on the second day without an agreement. The Trump administration said that the North Koreans wanted complete sanctions relief, while the North Koreans said that they were only asking for partial sanctions relief. 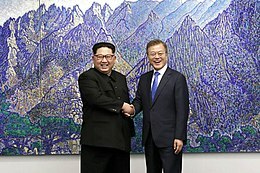 On 25 April 2019, Kim held his first summit with Russian President Vladimir Putin in Vladivostok, Russia. Kenji Fujimoto, a Japanese chef who was Kim Jong-il's personal cook, described Kim Jong-un as "a chip off the old block, a spitting image of his father in terms of face, body shape, and personality". He said Jong-un was a big fan of The Beatles and Jean-Claude Van Damme. During Dennis Rodman's trip, Vice magazine correspondent Ryan Duffy said that "the leader was 'socially awkward' and didn't make eye contact when shaking hands". ^ Kramer, Andrew E.; Sang-Hun, Choe (24 April 2019). "Kim Jong-un Meets Putin in Russia Amid Faltering U.S. Talks". The New York Times. ISSN 0362-4331. Retrieved 25 April 2019. ^ Bosman, Julie (March 1, 2019). "Trump Faces Fury After Saying He Believes North Korean Leader on Student's Death". New York Times. Archived from the original on March 13, 2019. Retrieved March 13, 2019. ^ "Vladimir Putin and Kim Jong Un hold first summit". www.cnn.com. 25 April 2019. Retrieved 25 April 2019. ^ News, A. B. C. "Kim Jong Un, Vladimir Putin share warm greeting at start of historic summit". ABC News. Retrieved 25 April 2019.